Our theme this month is Faithful Friends. Our designers are showcasing lots and LOTS of gorgeous projects. As you hop along, please leave a comment on each entry. One random commenter will be selected on each blog to win an image of choice from the FTHS store. And additionally, one commenter on the From the Heart Stamps blog will be selected to win a $15 gift voucher to the store! if so, then you are in the right place, if not why don’t you start on the From the Heart Stamps blog, so you don’t miss anything. Thanks for hopping with us today. The hop will end on Monday November 10th, 6 am EST. Winners will be posted on the From the Heart Stamps Blog on Wednesday November 12th. Oh Wow, how adorable is this! So creative, your coloring is amazing! I´ve never printed and colored on clothes. It looks super cool and i bet your Kids looks great in it. Wow!!! Adorable. I've been doing the fabric vinyl on the shirts but have not done a transfer such as this. I love it...I hope the boys do too. This is too cute Calypso. I love this image as a mom of boys, it's just perfect. You have got to share pics of your cuties in these shirts. This is just amazing! Calypso -- this is amazing and such a super idea! Gorgeous coloring, as always, makes it even more awesome!! This is absolutely stunning. Have to try this out for my nephews someday. Thanks for the inspiration. Simply STUNNING, Calypso! Beautiful coloring, it's so vibrant...I didn't realize you could transfer images to a t-shirt...so cool that the image is your sons! WOW....what an awesome idea! And your 2 'models' are just as handsome as can be :) LOVE IT!!! Cute. Both the shirts and the boys wearing them. Love this idea. What a brilliant idea, love the tee-shirts and the boys look so cute in them. My girls are all grown up now otherwise I would be lifting the idea myself! Thank you for sharing. What adorable boys!!!! And your T-shirts are also as cute as can be. I would love to know how to do this so I will be looking forward to your tutorial. The shirts are precious - but those little guys are beautiful!! They look so sweet I wonder if you have your hands full :) Great project Calypso - I can't wait to see the tutorial! What a fabulous idea. You are so super creative. Thanks for being part of this fun blog hop. What a wonderful idea, your sons will treasure these, thanks for your creativity. 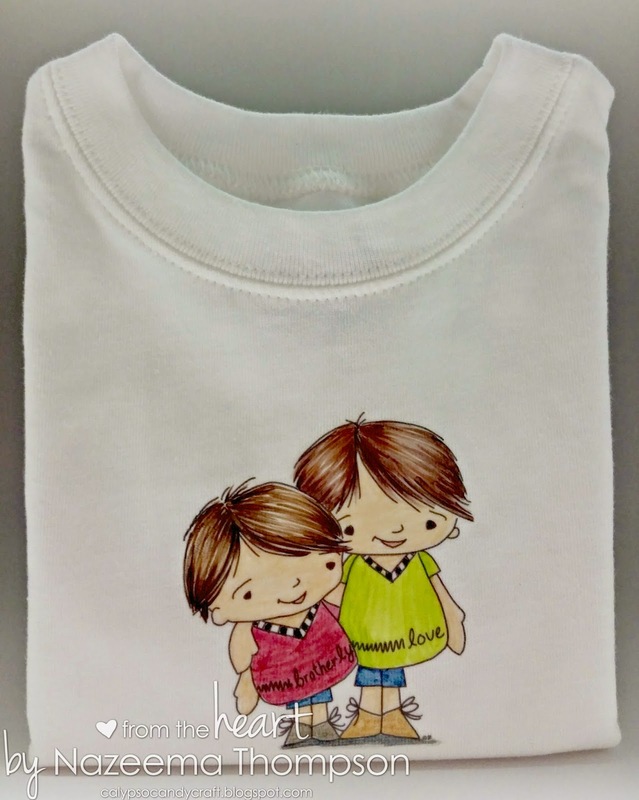 OMGoodness, these T-shirts are so adorable! I love your colouring! What a fabulous idea! 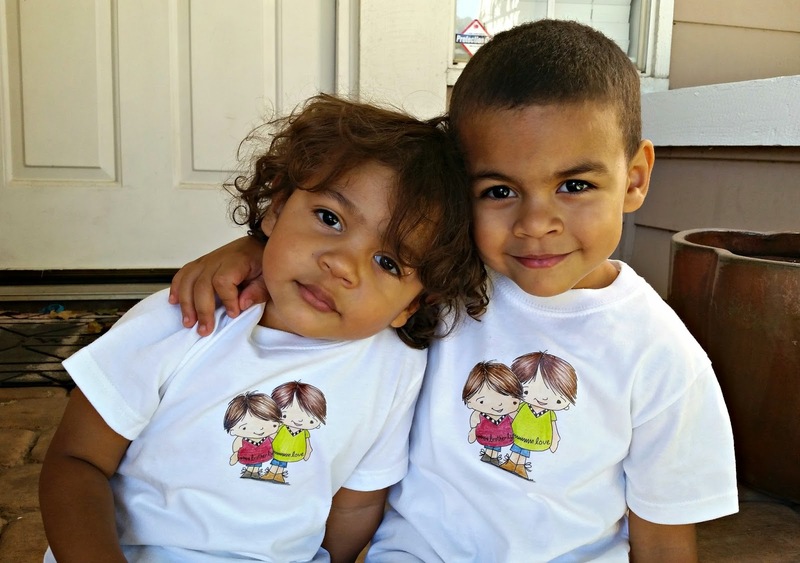 what a fabulous gift idea for 2 brothers to share, and your models are the cutest ever! ...did I say these shirts are awesome? Awe!!! Calypso, those shirts are awesome!! Great project and adorable models!! Your children look soooo cute in them.. Thank you for the blog hop!